Buffalo, New York – Aleron Group, a global workforce and business solutions company, continues to expand its market presence with the acquisition of TalentRISE, a Chicago-based firm specializing in executive search and recruitment process outsourcing (RPO), effective February 15, 2019. 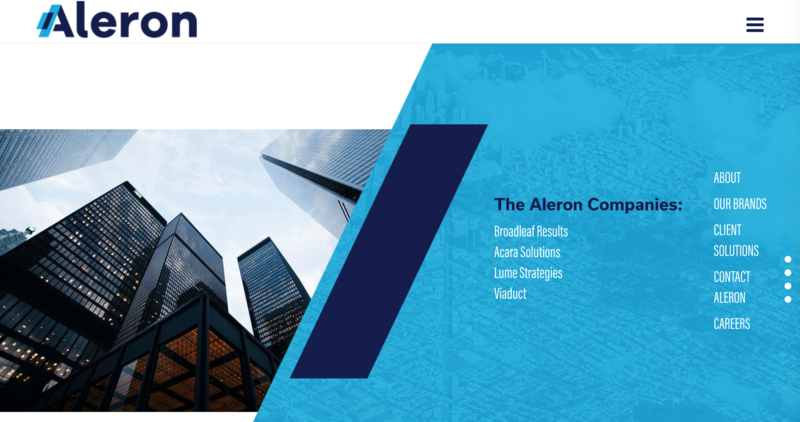 With the acquisition, TalentRISE becomes part of a growing family of Aleron brands that includes Acara Solutions, Broadleaf Results, Lume Strategies, and Viaduct, among others. JACKSONVILLE, Fla., April 18, 2018 -- Hueman People Solutions, a nationally-recognized recruitment company, has won the Gallup Great Workplace Award, a global recognition that honors thriving organizations dedicated to optimizing employee engagement. Hueman is among 39 leading organizations in the world to receive Gallup's highest honor this year. JACKSONVILLE, Fla., March 28, 2018 -- Hueman People Solutions, a nationally-recognized recruitment company, has acquired Agency a la Carte, a leading staffing and recruiting firm specializing in marketing communications and creative services. Founded in 1994, Agency a la Carte has served a variety of clients throughout Northeast Florida including EverBank, Adecco Group, Acosta Sales and Marketing, Regency Centers, Stein Mart and more.